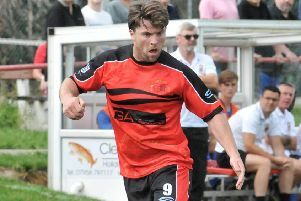 Lancaster City boss Darren Peacock has been delighted with his depleted squad’s start to the new season. The former Newcastle and Blackburn defender has been forced to patch together a side for both the 2-1 win at Burscough on the opening day and Tuesday night’s 1-1 draw with Bamber Bridge at Giant Axe. Hannu Tam, Antonio LaFuente and Elliot Allen-Facey are still waiting for international clearance while Danny Carlton, hamstring, Mike Hale, shoulder, and Adam Freeland, knee, continue to battle injury ahead of Witton Albion visiting the City on Saturday. Peacock said: “Considering the injuries we’ve got and the players still waiting for clearance four points out of six is a decent start. “It’s really frustrating. It’s times like this you’ve got to pull together. “We can’t sulk or moan and it’s a chance for the other lads. Those who have come into the side have taken their chance with Joe Whittington scoring on his debut on Saturday before AFC Fylde loanee Jake Gregory did the same against Bamber Bridge. Liam Breslin, who has featured for Garstang this season, and Luke Parkinson, of North Lancashire League side Highgrove, were also on the bench on Tuesday night with more new faces set to be at training tonight, Thursday. It’s not been all good news on the signings front however with another Fylde loanee Cory Bent, a wide midfielder, limping out of his first training session. Peacock said: “We signed Cory Bent from AFC Fylde at 7pm last Thursday and by 7.45pm he was injured. “He rolled his ankle in training and will be out for about a month. The injury news is better for City number one Hale however whose shoulder problem is not as bad as first feared. Peacock said: “It’s good news on Mike Hale. “He had a scan on Saturday and has done no serious damage. “We’re trying to sort out an injection for him to speed things up. “I’m not sure if he’s going to be ready for Saturday but if he’s not Mike Donlon has done really well so far. “Danny (Carlton) warmed up ahead of the Bamber Bridge game and we’ll see how he goes. City’s two games over the next week, Witton at Giant Axe on Saturday before a trip to Clitheroe on Tuesday, sees them face teams who have picked up a maximum six points from their first two games. But Peacock says his side should fear no-one, especially on home soil. He said: “Our home form last season wasn’t good enough really. “We want to make Giant Axe a place where we concede very little. “That’s what we want to get back to. *The Dolly Blues now know they will travel to North Yorkshire to face Marske United in the FA Cup preliminary round on Saturday, August 29, after the Northern League Division One side beat Seaham Red Star 3-1 in their extra-prelminary round replay on Tuesday night.